Another relentless day at the Extreme Sailing Series Cardiff presented by Land Rover saw the Extreme 40 fleet complete eight fast paced races in varied 10-23 knots over the tiny 550m track. With no runaway leader of the day, the results were a mixed bag for the teams, as they struggled with the gusty conditions, starting penalties and gear failure. In a change from yesterday''s winning form, The Wave, Muscat had an unusually low scoring day. Their string of race wins from yesterday were replaced with a string of fourth place finishes adding a conservative (by their standard) 57 points to their total; a respectable result on a day where most teams struggled. Having won in Cardiff for the past two years, McMillan and his experienced crew, including Double Olympic gold medallist Sarah Ayton, go into the final day with a 15 point lead. 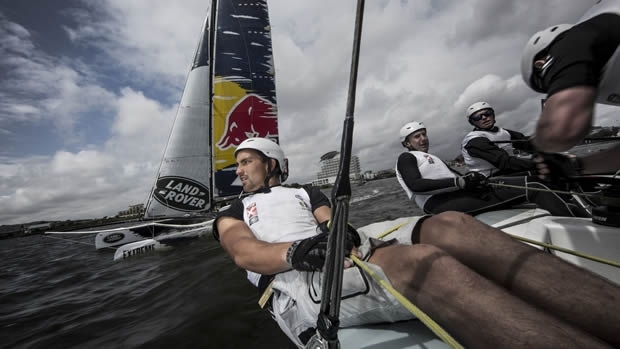 The real battle of the leaderboard today was for third place between GAC Pindar and Red Bull Sailing Team. After an excellent day's racing yesterday, GAC Pindar, co-skippered by Seve Jarvin and Chris Draper, struggled with consistency and penalties today, posting results that yo-yoed from first to sixth place, which ultimately left them in fourth place at the close of play. “I was silly and I didn’t really do the lads proud today," explained Draper. " I got us into trouble quite a few times but it could have easily escalated and turned into an absolute shocker of a day – we kind of salvaged it with a few race wins." In the chasing pack several teams suffered gear failure today as the boats and crews were put under pressure, dealing with the gusty conditions on the race course. Gazprom Team Russia finished the day on 163 points, in fifth place, despite a broken winch, but worst hit was Oman Air, which, after four good races, had to call it a day when its starboard mainsheet winch pulled clean off the deck, leaving her crew to limp ashore for overnight repairs ready for tomorrow's finale. Going into the final day of racing just 27 point separates the top three boats with conditions like today forecast and up to eight races scheduled. Racing kicks off tomorrow from 14.00 BST.